Click here to read the full “On A Clear Day You Can See Forever” review. The diagnosis is in for Harry Connick Jr.’s Broadway musical about a psychiatrist undergoing a psychic meltdown: It needs more time on the couch. Respect to director Michael Mayer and playwright Peter Parnell for their audacious attempt at reinventing a problematic musical in the Broadway revival of On a Clear Day You Can See Forever. The 1965 show has always been much loved for its lush Burton Lane score but denied the stamp of greatness by Alan Jay Lerner’s over-complicated structural mess of a book. The play initially was constructed as a vehicle for a star singer/comedienne (played by Barbara Harris on stage, Barbra Streisand on screen). The challenge and the fun came from watching an insecure neurotic instantly and repeatedly transformed through hypnosis into her glamorous, past-life self. Mayer has seen fit to divide this star part in half and have it played by two actors, removing the one element that thoroughly worked in the original. It’s a relief and a special pleasure to report that Mayer, in a square-cornered turn from his smart-rock productions of “Spring Awakening” and “American Idiot,” has joined playwright Peter Parnell to change an unworkable plot into a more-than-serviceable gender-bending framework. There’s a mostly-classy cast, a fantasy op-art set and almost two dozen wonderful songs from the Broadway production and the film. I was fortunate enough to see the show last evening. Although I felt the early part was slow and did not grab my attention, it was needed in order to build the story and introduce the characters. The first half did gain momentum and had some absolutely delightful scenes. The second half was just the opposite. It grabbed my attention from the start and not only held it but I thought was excellent. At time a tear jerker, at times funny, and at times amusing. The show is unusual and enters some unusual boundries. If you are expecting the original version, this certainly is not it. If you are willing to open up to new ideas and something different on Broadway, you may appreciate it as a beautiful but unusual love story, introduced in a unique way. I applaud Michael Mayer for taking the chance of entering a new arena with these radical and quirky changes. In this day of gay marriage, the storyline behind the show is even more appropriate. 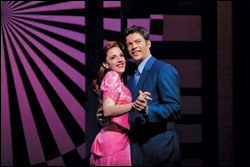 The actors protrayed their parts well but outstanding in her Broadway debut was Jessie Mueller who certainly deserved her numerous rounds of applause. I wnet expecting a strong musical but left having enjoyed a fun show, with some great songs, not muct dancing with the exception of an absolutely titilating three way dance between Harry Connick, Jr, David Turner, and Jessie Mueller. Harry Connick Jr. made this unique dance graceful and unique. I certainy would not say this was the best show I have seen, but I would see it again. It is not for everyone, but it was a very enjoyable evening.